Hutchinson hosts the local World Tai Chi and Qigong Day Event for Centre County At 10 am (Local Time) practitioners in tens of thousands in hundreds of cities, in over 70 nations come together to practice Tai Chi and introduce it to the public. He invites the public, other Tai Chi instructors, and health providers to join a special open class from 9am to 2pm. The class will meet in Talleyrand Park in Bellefonte weather permitting (Young's TKD is the Rain Location). “Tai Chi is an amazing art to begin to combat the effects of aging or long hours at a desk. It requires absolutely no equipment, and can be done in a very small space if needed. Many of my students find that in just a matter of weeks they start to tone up, increase balance, and have less aches and pains.” Said Mr. Hutchinson. This Year Bruce has added several additional events, on Friday April 19th he will present information on Tai Chi for health at 6pm at his Philipsburg Tai Chi Studios, on Saturday April 20th he will present In State College at the Schlow Centre Region Library community room at 1pm, and on Monday 22nd at He will return to Philipsburg for another presentation of The Martial Side of Tai Chi at 7pm. All leading up to the World Tai Chi Day Event. Mr. Hutchinson has been an advocate of Tai Chi in the Centre County since the 90’s. He has taught for the Osher Lifelong Learning Institute, the various Chapters of the Centre County YMCA, and Penn State Strength and Fitness. He currently has a school Tai Chi & Yoga attached to Young’s Tae Kwon Do in Bellefonte and his own school of Tai Chi and Yoga in Philipsburg. 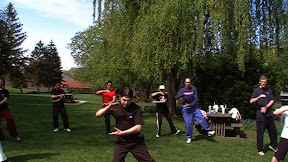 He is the founder of The Tai Chi Stepping Stones, a teaching method for traditional Tai Chi based on over twenty years of experience as a martial artist and medical provider. More information on World Tai Chi & Qigong Day or to contact Mr. Hutchinson please visit www.TaiChiTeacher.ORG or call (814)343-6299 or (814)359-2380.